"Doll wearing habit worn by Handmaids of Mary Immaculate"
Plastic doll is wearing a habit typically worn by the Handmaids of Mary Immaculate, founded in Helena, Montana, in 1952 by Mother Mary Stanislaus. 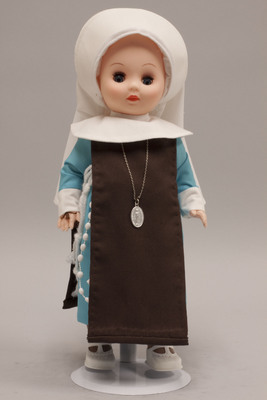 The doll is wearing a light blue habit with white cuffs, brown scapular, white veil, and a white collar. A metal medal hangs from a chain around her neck, and a rosary hangs from a white yarn belt around her waist.